Vinca minor (common name periwinkle) produces soft periwinkle blue flowers in early Spring to Summer. For gardening variation, also plant ground cover combination plants such as Pachysandra Terminalis or Variegated Pachysandra. Creeping periwinkle is a trailing ground cover vine that grows low to the ground with a good matting habit. Ground cover periwinkle produces soft blue vinca flowers and are shade loving plants. Once established are drought resistant ground cover plants. Plants are fast growing for more rapid coverage. Wondering about the differences between vinca minor and vinca major? Learn about them on our blog post Vinca minor vs Vinca Major. Buy vinca online at anytime - Plants ship year round. Adaptable to most any soil, but prefers fairly good soil and is easier to control than many other creeping ground cover plants. Also referred to as Trailing Periwinkle, Creeping Periwinkle or Creeping Myrtle groundcover plants. As with many fast growing plants, vinca can be invasive if left alone. With a little attention and care, it can be grown safely in most landscape settings. Plant spacing's for bare root vinca minor: 12 inches apart. 100 plants will cover 100 square feet. 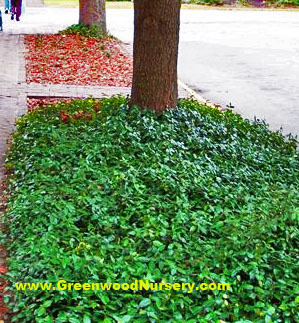 For larger landscape jobs, buy bare root vinca minor wholesale and save. Best vinca to buy online. Need low ground cover for shady, sloping area (Vinca minor). This is common vinca minor. I am looking for something just like the Vinca but since I live in Zone 9b I have a little more difficulty. Please letme know of another ground cover is available for this area and spread, etc.